So what do you do when the information you have will not fit on a leaflet or folded leaflet? Or maybe you are organising an event that needs a programme such as a fete or a theatre production? If you want to impress but still want to keep things on budget, then saddle stitched (stapled) booklets are the answer. 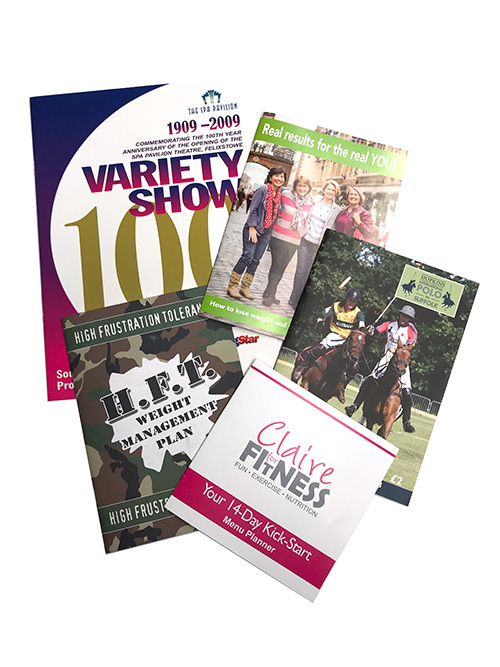 We can produce booklets in portrait or landscape in a range of sizes and proportions. We can further tailor the product to include a cover which can be thicker than the inner pages, or it can be self-covered, meaning that it is on the same paper stock as the inner pages. Maybe you’d like to add a more luxurious finish with a glossy laminated cover. There’s a whole range of options available, and as always we are on hand to guide and advise you through the process to make sure that what you get is what you want, the best solution to your requirements and at the best price. Copyright © 2019 Fizzwig Designs Ltd – 01473 351270 – Powered by Customify.